Public and private sector stakeholders around the world seek ways to ensure that the Internet provides the level of reliability and resilience we have long taken for granted from the telephony network. Unfortunately, in spite of the societal and economic impact of Internet connectivity disruptions, we lack near-realtime, scalable and validated methodologies and tools to identify and understand large-scale Internet outages. Based on experimental work in which we combined measurements at the control plane, active probing and passive traffic analysis, CAIDA developed an operational prototype system that monitors the Internet, in near-realtime, with the goal of identifying macroscopic Internet outages affecting the edge of the network, i.e., significantly impacting an AS or a large fraction of a country. Global Internet routing (BGP): we use data from ~500 monitors participating in the RouteViews and RIPE RIS projects to establish which network blocks are reachable based on the Internet control plane. 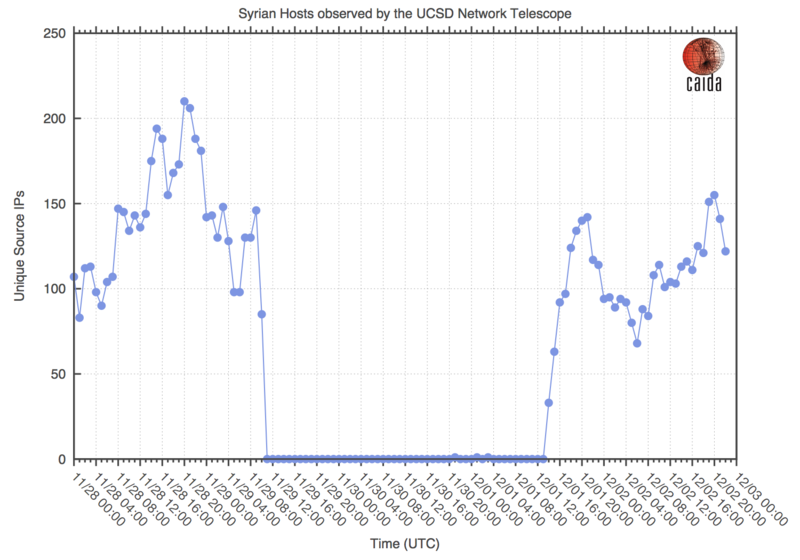 Internet Background Radiation: we process unsolicited traffic reaching the UCSD Network Telescope monitoring an unutilized /8 address block. Active probing: we continuously probe a large fraction of the (routable) IPv4 address space from several CAIDA Ark nodes distributed worldwide and use a methodology developed by University of Southern California to infer when a /24 block is affected by a network outage. Our outage inference system combines information from these three data sources, establishes the relevance of an event and generates alerts. The outage events and the corresponding signals obtained through automated analysis are displayed on dashboards and interactive graphs that allow the user to further inspect the data. 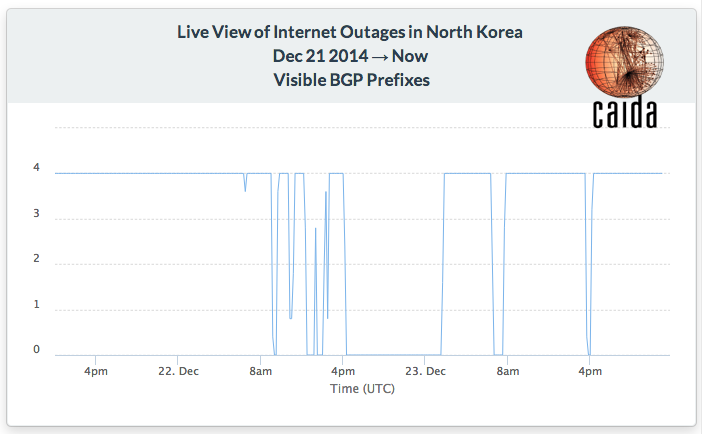 Live view of the reachability of BGP prefixes geolocated to North Korea (last 7 days), and linked view of December 2014 outages in North Korea. Animation showing the evolution of the RouteViews and RIPE RIS BGP measurement infrastructure since 2001. An experimental visualization of the impact of the Sandy hurricane (2012) using data from active measurements from Planet Lab nodes carried out by the University of Maryland. Comcast We are collaborating with Comcast researchers, who are using IODA to support their own research on Internet reliability and performance. In addition, Comcast, through their Innovation Fund provided a research grant for the development of visual interfaces to monitor and characterize Internet outages. Cisco We established a collaboration with researchers at Cisco Systems, who are using BGPStream and are collaborating in extending it to support internal and open source projects carried out by Cisco, such as the OpenBMP implementation of the BGP Monitoring Protocol. FCC The Public Safety and Homeland Security Bureau (PSHSB) of the Federal Communications Commission (FCC) has the responsibility for ensuring that communications networks are reliable, resilient and secure. To accomplish this task, the PSHSB developed a data-driven process centered on collecting information on and performing analyses of communication outages. CAIDA had several meetings with the FCC to discuss results of the IODA project, providing the FCC with additional insight into the complexity of Internet outage monitoring and to discuss technology transfer of some of these research results and infrastructure capabilities. We released the software components we developed in this project with an open source license. Several of the project's software components offer general applicablity to research and applicative fields of networking. BGPStream BGPStream is an open-source software framework for live and historical BGP data analysis, supporting scientific research, operational monitoring, and post-event analysis. Although BGP is a crucial operational component of the Internet infrastructure, and is the subject of research in the areas of Internet performance, security, topology, protocols, economics, etc., there is no efficient way of processing large amounts of distributed and/or live BGP measurement data. BGPStream fills this gap, enabling efficient investigation of events, rapid prototyping, and building complex tools and large-scale monitoring applications (e.g., detection of connectivity disruptions or BGP hijacking attacks). DBATS DBATS is a high performance time series database engine optimized for inserting/updating values for many series simultaneously. DBATS can easily sustain write speeds of more than 1.6 million values per second, and CAIDA has used DBATS databases with more than 40 million distinct series. libtimeseries libtimeseries is a C library that provides a high-performance abstraction layer for efficiently writing to time series databases. 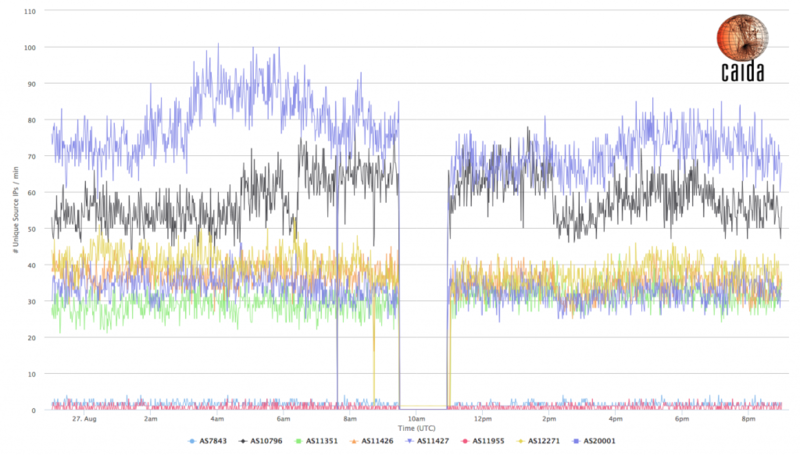 It is optimized for writing values for many time series simultaneously. Corsaro Corsaro is a software suite for performing large-scale analysis of trace data. It was specifically designed to be used with passive traces captured by darknets, but the overall structure is generic enough to be used with any type of passive trace data. Corsaro enables IODA's processing of IBR captured at darknets to provide time series for outage detection and analysis. Alberto Dainotti was awarded the Applied Networking Research Prize at IETF-84 for his research into Internet communication disruptions due to filtering. This platform was supported by NSF grant CNS-1228994 Detection and Analysis of Large-scale Internet Infrastructure Outages (IODA), DHS S&T contract HHSP 233201600012C Science of Internet Security: Technology and Experimental Research, and DHS S&T cooperative agreement FA8750-12-2-0326 Supporting Research and Development of Security Technologies through Network and Security Data Collection. Additional funding to work on visualization interfaces was generously provided by a Comcast research grant. This research uses resources of the National Energy Research Scientific Computing Center (NERSC), a DOE Office of Science User Facility supported by the DoE Office of Science under contract DE-AC02-05CH11231. This work also makes use of the Extreme Science and Engineering Discovery Environment (XSEDE), which is supported by NSF grant ACI-1053575. This platform is also supported by the Open Technology Fund under contract number 1002-2018-027. Special thanks to Emile Aben for his inspiration and feedback, and to Brian Kantor and Nevil Brownlee for their assistance in this project.